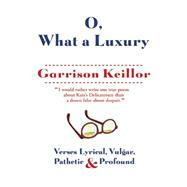 O, What a Luxury: Verses Lyrical, Vulgar, Pathetic & Profound is the first poetry collection written by Garrison Keillor, the celebrated radio host of A Prairie Home Companion. Although he has edited several anthologies of his favorite poems, this collection of his very own poems astounds us with its breadth and variety, its wit and wisdom. He is a master of light verse, writing on love, marriage, modernity, nostalgia, perversity, publicity, politics, religion, birthdays, fatherhood, and other facets of daily life; his subjects range from highbrow to lowbrow: Michigan to Kansas, Sunset Boulevard to Times Square, Beethoven to Elvis, chocolate bacon cake to onion soup. His voice is utterly American, his scope entirely universal. These charming, playful verses find sublime song within the humdrum of being human. Garrison Keillor lives in St. Paul, Minnesota, home of A Prairie Home Companion, his radio show that has been on the air since 1974. He is the author of many books including the Lake Wobegon novels, and he edits the Good Poems anthologies. He is a contributor to the New Yorker, Atlantic Monthly, and Salon.com. In 2006, he wrote the screenplay for the film A Prairie Home Companion, directed by Robert Altman.